The UICode block starts with the "#region UICode" line, ends with the "#endregion" line, and contains one line for each control you wish to include in your effect UI. Each of those interior lines defines a variable for use in your render loop and describes to CodeLab how you want the control to look. You may include as many or as few lines as you wish. 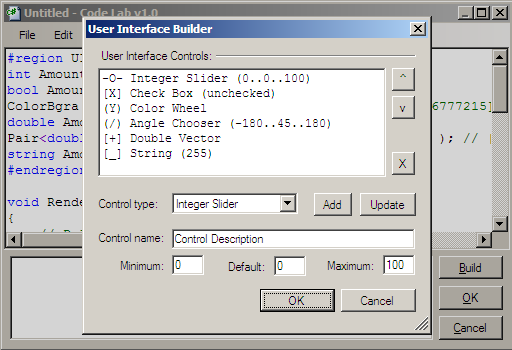 The default script contains definitions for 3 integer sliders that have a default value of 0 and a range of 0 to 100. The "User Interface Controls" list box shows one line for each control your effect will have. Click on a User Interface Control to select it. Then, you can use the "X" button to delete it, or use the ^ button to move it UP the list or the v button to move it DOWN the list. The order the controls show up in the list box is the order they will show up in the final UI when your effect runs. 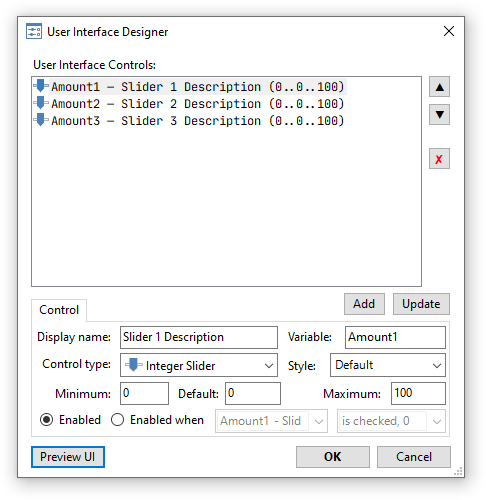 a special drop-down list box called User Blend Ops "[B]"
another special drop-down list box called Font List "[F]"
When you click on a control in the User Interface Controls list, the fields at the bottom of the designer will be populated with the details of that control. You can then update/modify those values and click either the Add button (to add a new control to the bottom of the list) or the Update button (to save those modified values back to the selected control). When you select a control type in the drop-down list box, some of the Min, Max, or Default boxes may become disabled. In those cases, that information can not be changed for that type of control. For example, for a check box, the minimum value is always 0 (not checked) and the maximum value is 1 (checked). You can only supply the default state of the check box in the Default box. The default for the Color Wheel is the current Primary color as selected in the colors docker window. If a second color wheel is used, it will default to the Secondary color as selected in the colors docker window. The Maximum value for a String control refers to how many characters the user can enter into the control. The Min, Max, and Default boxes are "tied together" to keep you from entering illegal value combinations. Once you are happy with the control list, press the OK button to update your CodeLab script with your UI design. Note: Advanced users that are familiar with how the UI Builder works can edit the UICode region lines directly. 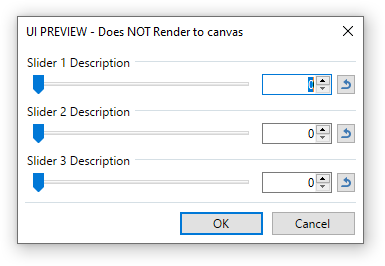 Once you have designed your UI, you will need to write some code in the Render function to take advantage of the various controls that you have included. Here is some sample code for user interface elements.